Advanced tuning for Azure SQL Data Warehouse (SQL DW) just got simpler with additional data warehouse recommendations and metrics. SQL DW is a flexible, secure, and fully managed analytics platform for enterprises optimized for running complex queries quickly across petabytes of data. Often times advanced tuning scenarios with SQL DW can be a challenge without the proper tools to seamlessly uncover performance insights into your data warehouse workload. This can lead to hours of troubleshooting efforts where you must ensure proper monitoring practices are continuously followed. SQL DW provides a built-in holistic management experience by having a tight integration within the Microsoft Azure ecosystem, specifically Azure Advisor and Azure Monitor. These two services are immediately configured by default for SQL Data Warehouse to automatically deliver you workload insights at no additional cost. 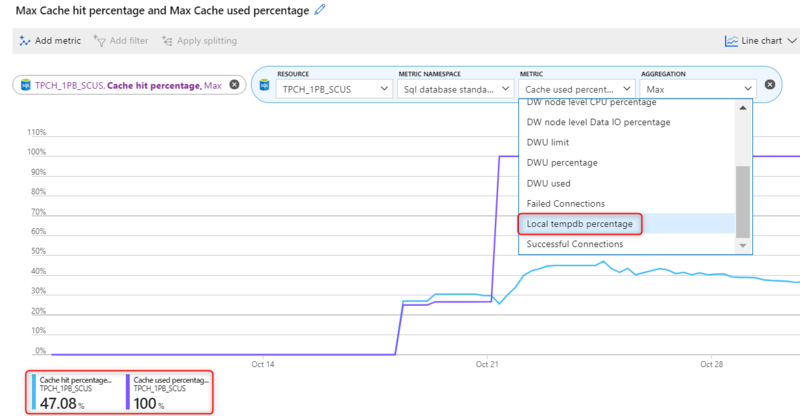 Adaptive cache – Be advised when to scale to optimize cache utilization. Table distribution – Determine when to replicate tables to reduce data movement and increase workload performance. Tempdb – Understand when to scale and configure resource classes to reduce tempdb contention. There is a deeper integration of data warehouse metrics with Azure Monitor including an enhanced customizable monitoring chart for near real-time metrics in the overview blade. You no longer must leave the data warehouse overview blade to access Azure Monitor metrics when monitoring usage, or validating and applying data warehouse recommendations. There are new metrics available, such as tempdb and adaptive cache utilization to complement your performance recommendations.